Here you'll find Course Flowsheets, Pathways, prerequisite policies, information about tutoring services and more. Here at the University at Buffalo’s School of Engineering and Applied Sciences, we are committed to promoting and supporting women in engineering, science, technology and math. The State University of New York (SUNY) LSAMP program seeks to diversify the STEM workforce by significantly increasing the numbers of students successfully completing high quality degree programs in science, technology, engineering and mathematics (STEM) disciplines. Find resources for professionalism, online course offerings, professional development opportunities and more. Looking to start a business? We've got the resources and connections to make your vision a reality. We are dedicated to ensuring a welcoming, inclusive and safe environment for all members of the UB community, including our LGBTQ+ students, faculty, staff and community members. Explore our services and resources to better understand diverse identities and experiences. We know technology plays a big part in your academic success. 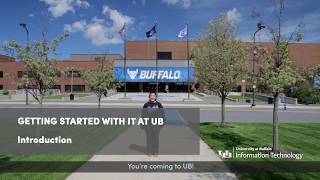 Watch these videos to learn about UB's eduroam Wi-Fi, your new UBITName and email address, free software, online learning, printing and connecting tech in on-campus housing.